New listingFinal Fantasy. Echoes of Time. Wii. Excellent condition. Original UK PAL release which is new & factory sealed, with the clear, red recycle symbol embossed tear strip. UK PAL version. UK - £2.00. Overall good factory sealed condition. A fair amount of shelf wear. 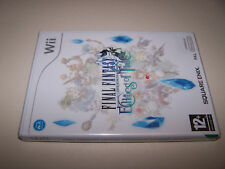 Final Fantasy : Echoes of Time - Nintendo Wii - Great JRPG! Nintendo Wii. All serial numbers are checked to prevent scamming. st Class Large letter. Good overall condition, but no manual. 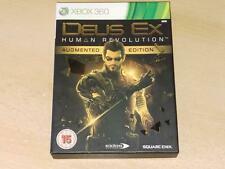 Xbox 360 Game Deus Ex Human Revolution Augmented Edition Factory Sealed! Great for a collectors piece! Final Fantasy Crystal Chronicles - The Crystal Bearers for the Nintendo Wii. Disc good condition. Case In good condition. Final Fantasy Fables Chocobos Dungeon Wii. Condition is Good. Dispatched with Royal Mail 1st Class Large Letter. No manual. Final Fantasy Fables Chocobo's Chocobos mystery Dungeon - Nintendo Wii PAL. Condition is Very Good. Dispatched with Royal Mail 2nd Class Letter. 'Crystal Bearers'. FINAL FANTASY. Both complete. Final Fantasy Tales: Chocobos Dungeon Wii. Title:Final Fantasy Tales: Chocobos Dungeon Wii. All of our paper waste is recycled within the UK and turned into corrugated cardboard. General Interest. Your item will be previously owned but still in great condition. Where you must uncover a vast conspiracy ! The item is great condition and in full working order. Further Information. Health and safety precautions booklet. Final Fantasy Fables - Chocobo's Dungeon ( Nintendo Wii ). 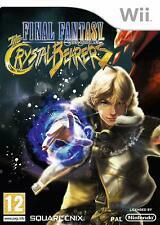 Final Fantasy Crystal Chronicles The Crystal Bearers (Wii) (New). His body imbued with the power of crystals. He possesses abilities greater than ours and powers that can cause us grievous harm. Is he a savior, or is he damned.?. Wii Final Fantasy Crystal Chronicles: The Crystal Bearers & Echos Of Time Bundle. Condition is Very Good. Final Fantasy Fables - Chocobo's Dungeon. Nintendo Wii. Case, inlays, manual and disc included. EAN: 5050053016577. Final Fantasy Crystal Chronicles: Crystal Bearers (Wii). Title Final Fantasy Crystal Chronicles: Crystal Bearers (Wii). Publishers will often change book or CD cover designs, in a small number of cases the item dispatched may bear a different cover design from that advertised. FINAL FANTASY FABLES CHOCOBOS DUNGEON - NINTENDO WII - PAL / FR - BRAND NEW! Nintendo Wii. Final Fantasy. Plattform Nintendo Wii. -New item without orig. USK-Einstufung USK ab 6. Chrystal Chronicles. Final Fantasy Christal Chronicles The Crystal Bearers. Final Fantasy Christal Chronicles The Crystal Bearers for the Wii. Platform: Nintendo Wii. Genre: Action & Adventure. Condition: New. (all other Countries). FINAL FANTASY CRYSTAL CHRONICLES: THE CRYSTAL BEARERS FOR NINTENDO WII. Plataforma Nintendo Wii. Características Manual incluido. Estado: Completo. DISCO: 9/10. Nintendo Wii: Final Fantasy Crystal Chronicles - The Crystal Bearers [Top RPG] Complete. Full ,French version - PAL. Screen : French. Code de région PAL. Langue Français. EAN 5060121826014. Notice Français. Manuale incluso Sì. Giocabile on-line No. Piattaforma WII. Genere Giochi di ruolo.